If you love your dogs like we do, choosing the best-quality dog vitamin in order to give them a full and vibrant life, is a crucial part of caring for them. That was our basis for selecting the best dog vitamin for your pet. We looked at a long list of factors that we felt were important in choosing a dog vitamin. From that we choose the best products out there and put together a complete list of our top choices to help you care for your furry friend. Whether you are helping your dog deal with joint issues, or your pet is just an extremely picky eater, you want to be sure they are getting the nutrients they need. Dog vitamins can be a valuable resource to help keep your dog healthy and happy. The top-rated dog vitamins in this review can improve the quality of life for your dog and give them the nutrients they need for a long and healthy life. There are many reasons you might consider dog vitamins. Your dog may have an ongoing health problem such as skin issues or joint issues that you want to take care of. Your vet may recommend a dog vitamin if your dog is aging or if they are very young and growing by leaps and bounds. Whatever the reason, if your vet has recommended them or approved their use with your pet, you can use any one of these great vitamins to see positive results in your dog as their nutrition improves. Many dogs can have skin, coat and digestive issues. This excellent supplement can help turn those things around and help improve, not only your dog’s coat and skin, but their overall health as well. This seaweed, kelp-based meal powder can be added right into their food to provide the essential vitamins, minerals, antioxidants, and amino acids that they need to be in optimum health. This seaweed meal powder provides iodine and chlorophyll and it is rich in Omega-3 fatty acids as well. 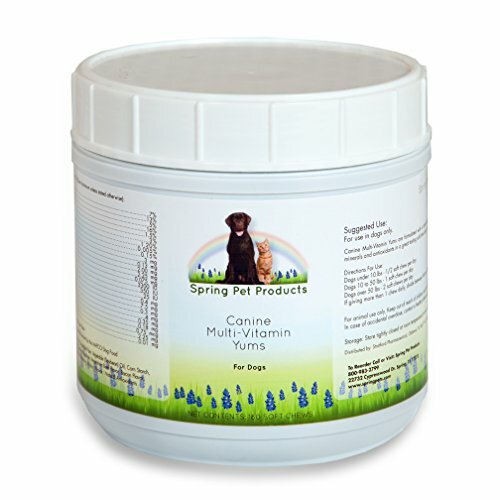 Giving your dog this Sea Meal Powder will help their immune system and you will see excellent results if you use it consecutively for about three weeks. Just like with human vitamins, if you only give it to your dog once in a while or when you remember it, maximum benefits won’t be realized. 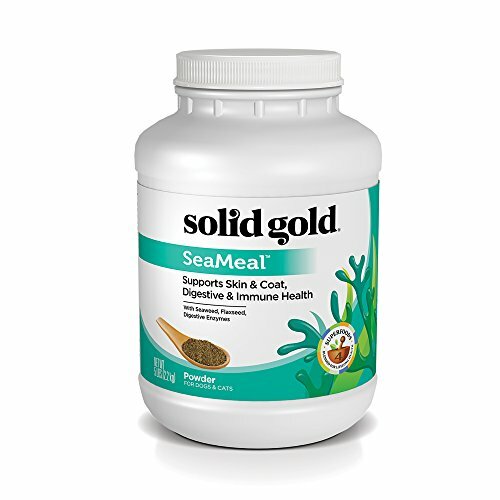 As good of a product as this Sea Meal Powder is, it is a supplement and not a replacement and should never be used in place of providing good-quality food for your dog. It is made up of three types of seaweed species; red, green and brown. This combination provides a great nutritional supplement for your pet and you will notice improved health and energy. What better way to provide your dog with a daily supply of EPA and DHA than to give them this excellent Salmon Oil supplement by Grizzly? The necessary amount is given based on your dog’s weight, so your dog always has the right amount of important Omega-3 fatty acids in their system. Your dog will get 500-2500 milligrams of Omega 4 fatty acids (the exact amount will vary according to your dog’s weight) and anywhere from 50-300 milligrams of linoleic acid which is a major source of omega-6 fatty acid. The vitamin traces and antioxidants found in this excellent supplemental product are naturally found in salmon. It doesn’t affect your dog’s intake of vitamins that they obtain from other sources as well. It’s very gentle on your dog’s system and requires no prior conversion before the dog’s system can utilize them. The extraction process keeps the oil away from the air until you add it to your pet’s food, ensuring its purity and effectiveness. Since it is an all-natural product, you may notice a difference in color from one bottle to the next which is completely normal and does not affect the supplement’s effectiveness at all. The 15+ Omega 3’s, Omega 6’s and Arachidonic fatty acids provide many health benefits that will improve your dog’s health and well being. 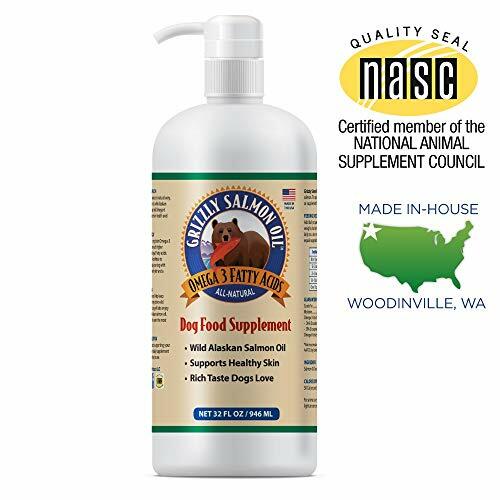 This 100% pure salmon oil comes from wild Alaskan Salmon only and comes in several convenient sizes for your use. With these adorable little heart-shaped multivitamins, you will provide your beloved furry family member with essential minerals, antioxidants and vitamins that they need for great health and well being. Even their coats will shine with good health. This 100%, manufactured-in-the-USA dog vitamin has a 100% customer satisfaction guarantee. These vitamins are manufactured in the USA and are fresh, pure, and high-quality. Your dog will love the soft chews that are packed with natural bacon and smoke flavor that dogs love. These water-soluble vitamins are not stored in your dog’s system so be sure to give them their vitamin supplement every day for best results. The Biotin and Zinc that are also present in these great vitamin chews, along with all the others, help with skin, coat, immune system, healthy blood cells and bone formation as well. It even has Choline for healthy brain and liver function. Dog vitamins don’t have to be a mystery. With any of these-top rated dog vitamins, your dog will have improved health, greater vitality and a healthy, shiny coat. They are all natural, easy on the digestive system and easy to administer as well. We’ve provided a detailed buyers guide to provide you with even more information on dog vitamins and how to choose the right ones for your dog’s needs. When there are so many choices out there, it’s great to have a reliable resource that can help guide you in the right direction so you’re not wasting your money on something that won’t provide your dog with what he or she needs. Continue reading below to prepare yourself with all of the information you will need to make your choice much easier and more stress free. What is a Dog Vitamin? There are several factors to look at to determine whether your dog can benefit from vitamins and if so, what kind to get. If you feed your dog a high quality commercial dog food, chances are they won’t really need additional vitamins unless it is for a specific condition such as a joint improvement vitamin. Veterinarians are crucial for helping you create a feeding and supplement program that will improve the health and quality of life for your dog, so be sure to enlist their help before you start shopping so they can give you an idea of what you will need. The vitamins listed below are the ones that are the most important for your dog’s health and well being. Each one plays a different role in your dog’s overall health. Vitamin E and Vitamin A – Both of these vitamins are good for helping your dog burn fat efficiently. This is especially helpful if your dog is carrying more weight around their middles than is recommended. They are also excellent antioxidants and are very beneficial for slowing down aging and keeping your dog healthy. Vitamins A and E are also great for skin and eye health. Vitamin B-12 – This vitamin is great for cell growth and development making it an important vitamin for growing pups. Vitamin D, Calcium and Phosphorus – These three vitamins and minerals work together to strengthen your dog’s teeth and bones. They are very important in both a growing pup’s diet and an adult dog as well. Iron – If you want to choose a mineral that will help with providing your dog with healthy blood and also improving the transport of oxygen through your dog’s body, Iron is the one to look for. High quality meats contain good amounts of iron so if your dog is on a natural, raw meat diet, chances are they are getting a good amount of this mineral. Potassium – Your dog’s heart will be improved and protected with the addition of potassium to their diet. Potassium is easily found in carbohydrates, but a good supplement will most certainly have it as one of the ingredients. Vitamin C – The benefits that dogs derive from Vitamin C are the same that humans get; an improved immune system, faster healing and they won’t be as prone to illness too. What are the Dangers in Giving a Dog Vitamins? If your dog is already eating a high quality diet full of nutrients and vitamins and you give additional vitamins on top of that, you can cause harm to your fog’s health. A good example of this is calcium. Having too much calcium can cause bone and skeletal problems. If a dog has too much vitamin A, especially in the larger breed pups, they can experience dehydration, joint pain and their blood vessels can even be harmed. As much as vitamin D can be beneficial, too much vitamin D in a dog’s system can harm their bones, atrophy their muscles and even cause them to stop eating. Always make sure that your dog NEEDS the vitamins you are supplementing with. Even though it may seem like you’re doing something that will help them, there is such a thing as too much of a good thing when it comes to vitamins. Asking your vet about vitamins for your dog can prevent any of the above overdosing from happening but it can also prevent you from spending money on the wrong type of vitamin. Your dog may need certain supplements that you may not really know anything about. Conferring with your dog’s veterinarian will help you come up with the right vitamins and supplements for your dog and his or her particular health issues and circumstances. Supplements should never replace veterinary care, so if there is a potential health problem, don’t self diagnose, ask them and be sure. For dogs that have joint problems such as arthritis, it isn’t uncommon for a pet owner to give their dogs Glucosamine-chondroitin. It is usually given to dogs with arthritis and can be very beneficial in moderate to severe cases. You need to give it to them for an extended period of time and not hit or miss. 70 days was the documented study done where improvement in mobility and a decrease in pain were noted. If your dog is having skin or coat issues where they are itchy, dry and flaky, fish oil supplements can be a real game changer. The fatty acids in fish oil can improve the condition of both the skin AND the coat. Another benefit to fish oil supplements is that is has been shown to reduce inflammation as well. The vitamins of C and E are also used to reduce inflammation and promote faster healing as well. These two vitamins have also been shown to have a positive impact on an aging dog’s memory capability. Just because a dog food says it has certain vitamins in it, doesn’t mean it really has them in it. Checking things out on your end before your purchase will give you more insight as to the accuracy of the company’s claims. Always check the company out to make sure that what they are promising is what you are actually getting. There are several things you can do when it comes to choosing the right vitamin supplement for your dog. We’ve outlined these tips below to help aid in your choosing process and make it much simpler and less confusing for you. Look for brands that have actual clinical studies to back up their claims. It is also a good idea to find companies that specialize in one particular area such as joint health, heart health, etc. Read those labels! You need to know exactly what you are looking for when you start shopping. You don’t want to go on simply the one that has the best “story” but the one that has the ingredients you are looking for. Does the company do quality control checks? The way you can tell this is to look for a lot number on the supplement you are considering. If it sounds too good to be true…beware. If a supplement is promising to completely erase hip dysplasia or other serious ailments, you want to steer clear. While a good supplement can make drastic improvements, elimination of the condition is more than likely an advertising hype and not reality. Only give dog vitamins and supplements to dogs, not human ones. Some human supplements can be really dangerous for a dog so stick to the ones that are formulated and produced specifically for dogs. Certification is important so look for supplements that have been independently verified. This means an outside company checked them out and verified them, it didn’t come from inside the supplement’s company. When it comes to vitamins, it pays to be both well informed and careful about the ones you choose. Enlisting the help of your veterinarian as well as the information in the buyer’s guide will enable you to choose the perfect dog vitamins for your dog. Choosing the right supplements and dog vitamins can improve your dog’s health and quality of life and make them a much happier fur pet to have in your home. No pet owner wants to see their dogs suffer. With the right food and vitamins, you can ensure that they are as healthy as they can be.